kol banda is native Indonesia medical plant, especially in the eastern islands, and in Java and other places. It grows well in the forest, beaches and other open spaces such as a hedge in the yard, in the garden as an ornamental plant or grow wild and can be found 100-300 m above sea level. Shrubs or small trees, about 5-13 m, branching rather flat so that it looks shady. Single leaf, stemmed, elongated ellipsoid shape, flat edge or serrated, pointed tip, base obtuse, 9-24 cm, 3-16 cm wide, pinnate leaves bones. 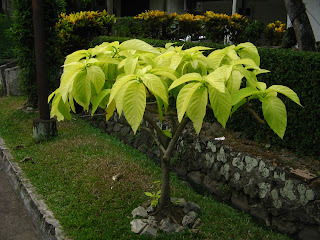 Young leaves that grow on the stem end of the color white to pale yellow, light green leaves old. this medical plant have flowers are small tube-shaped, compound interest and rarely found. CHEMICAL PROPERTIES AND EFFECTS pharmacological: Leaves: The smell is weak is not unique, fresh taste. Anti-inflammatory (anti-inflammatory), germ killer (antiseptic).